Albert G. Spalding's genuine signature is found on letters stolen from the NYPL collection bearing his name. There’s no shortage of genuine exemplars of handwriting available for so-called experts to authenticate signatures of Hall of Fame pitcher and nineteenth century sporting goods magnate Albert Goodwill Spalding. In most of our reports Spalding’s name is linked to the infamous thefts from his magnificent baseball collection housed at the Fifth Avenue branch of the New York Public Library in New York City. Some of the items stolen from that collection include handwritten letters sent to his friend and associate, Harry Wright, who served as his manager and mentor when he played for the Boston Red Stockings in the early 1870s. Wright’s diaries, account books, correspondence and scrapbooks were the cornerstone of Spalding’s collection and over the years have been the target of thieves who have raided assorted volumes and manuscript pages for autographs and valuable ephemera. Just this week a page that was torn and wrongfully removed from Wright’s account books housed at the NYPL appeared for sale at Premier Auctions in Arizona and went for a hammer price of $1,099. (The same stolen ledger page sold at RR Auctions in 2009 for over $1,000 and was described by Steve Grad of PSA/DNA as being written in a different hand but signed by Wright). The NYPL inventory of the Spalding Manuscript collection conducted in 1986 and 2005 shows that the collection’s Wright “Note and Account Books 1860-1893″ have three volumes missing and many pages of the surviving volumes have been vandalized. NYPL’s Brook Astor Director of Collections Strategy, Victoria Steele, did not return calls for comment on the sale of the manuscript page, which was actually written (and signed) entirely in Harry Wright’s hand. 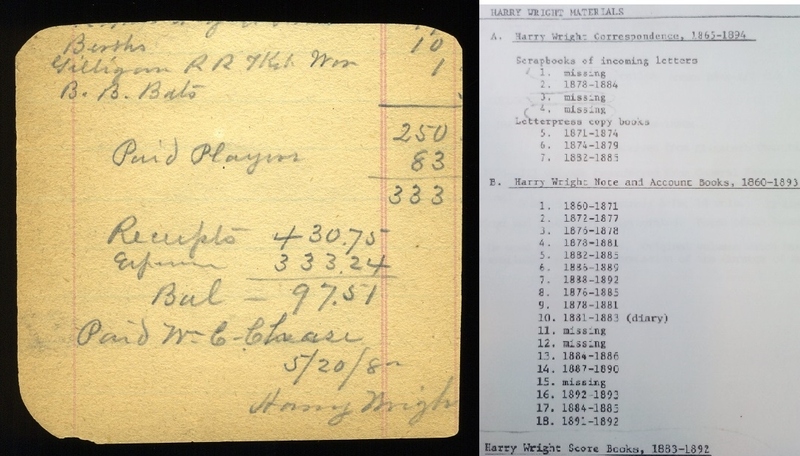 Premier Auctions in Arizona is offering this account ledger page (left) with Harry Wright's autograph in its current auction; The vandalized page originated from the NYPL's Harry Wright Note and Account Books archive which was listed in a 1986 inventory (right). The stolen NYPL items extend to handwritten letters penned by Albert Spalding to Wright which have also been sliced and diced out of voluminous scrapbooks created by library officials when they received Harry Wright’s correspondence collection as part of a donation from Spalding’s widow in 1921. Two extremely significant Spalding letters have been sold in the last decade at auction and are, no doubt, missives wrongfully removed from one of the four scrapbooks of Wright’s personal correspondence that used to sit on the shelves of the rare books and manuscripts division of the library. Collector Barry Halper was the mastermind of the library heist and as early as 1977 he was showing off his stolen treasures to sportswriter Bill Madden on the pages of The Sporting News. In 2009 a “cache of rare letters” from the Wright correspondence collection appeared for sale at MLB’s FanFest auction and an FBI investigation was commenced. Of course the letter was found to be authentic by the alleged experts James Spence and Steve Grad, as it was once part of Harry Wright’s personal archive housed at the library in volume 1 of the Wright Correspondence scrapbooks. Lifson didn’t mention that fact in his lot description or the fact that the reverse of the last page exhibited evidence of having been once adhered to a scrapbook page. Still, the authenticators had four full pages of Spalding’s actual authentic handwriting to examine and also file away in their exemplar files for future authentications. This authentic 4-page letter written in 1874 by Spalding to Harry Wright was stolen from the NYPLs Spalding Collection and sold for close to $25,000 in a 2004 Robert Edward Auctions sale. At the same time the REA Spalding letter was being sold another appeared on the market in a Mike Gutierrez auction that was also addressed to Wright and dated from New Years Eve, 1877 (and also originating from NYPL Wright scrapbook Vol. 1). This page from a 2004 Mike Gutierrez auction catalog shows the sale of another Spalding letter stolen from the NYPLs Spalding Collection. The letter is also addressed to Harry Wright and discusses National League issues for the 1878 season on New Years Eve, 1877. 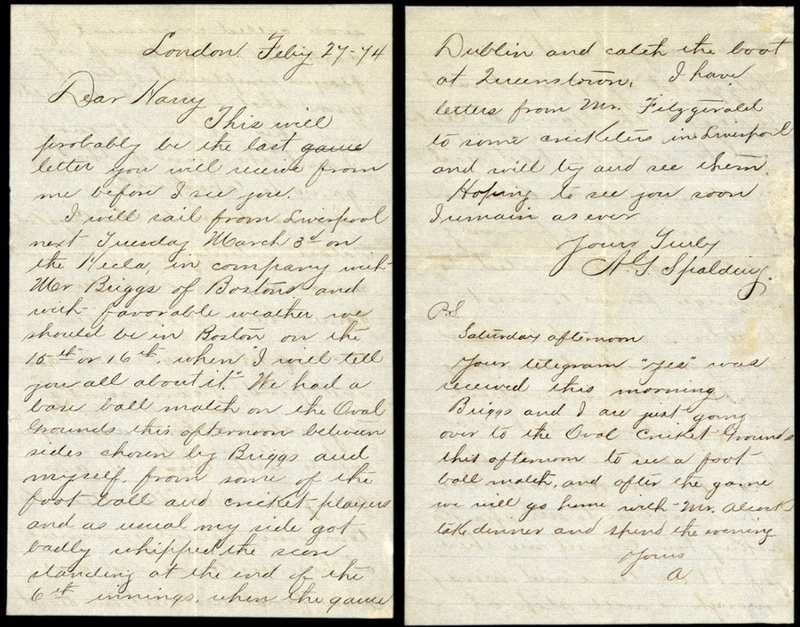 The letter is proof positive that Steve Grad of PSA/DNA and other authenticators like Gutierrez and James Spence had examined and possessed authentic exemplars of Spalding’s genuine handwriting in their exemplar files– several handwritten letters spanning from the 1870s to the turn of the 20th century. 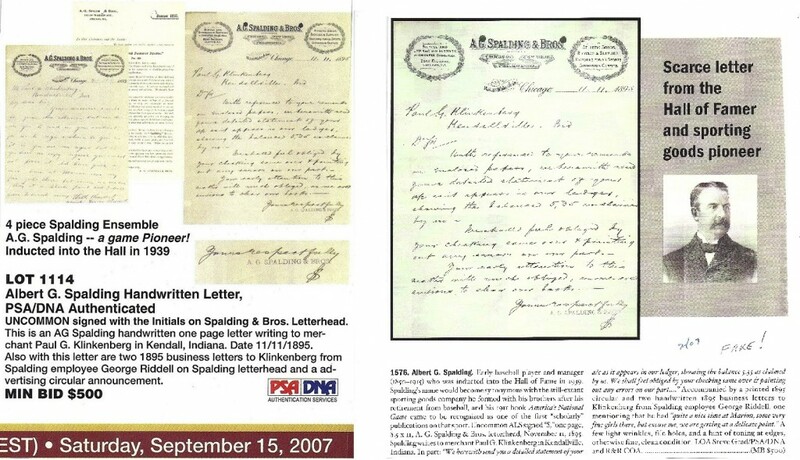 A letter written by a Spalding employee (and not AG Spalding) was sold at Memory Lane Auctions (left) and RR Auctions (right) in 2007 with an LOA from Steve Grad and PSA certifying it as authentic. The auction house said the letter was signed “S” and was accompanied by an LOA from Steve Grad and PSA/DNA and another from RR Auctions. 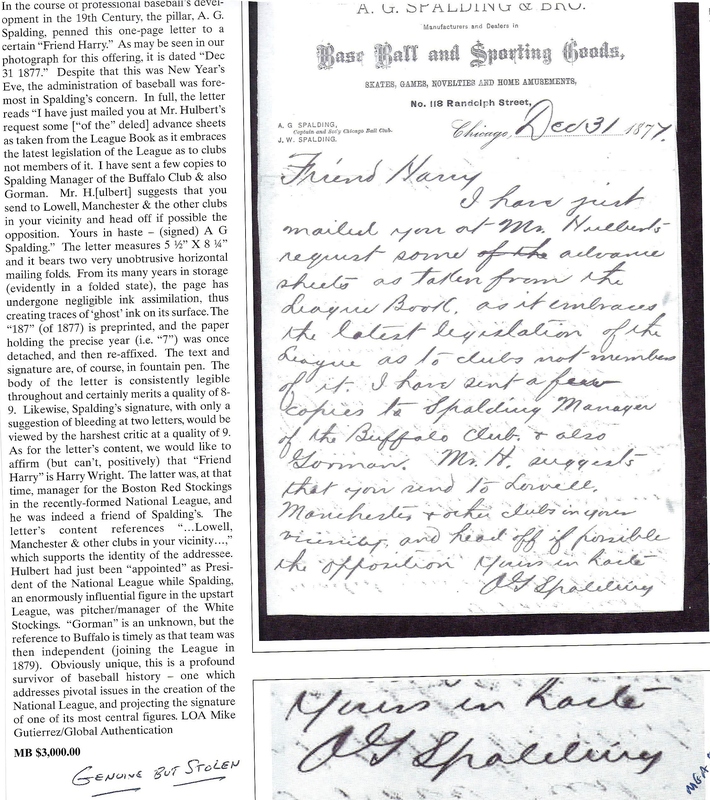 Neither the auction house nor the authenticators bothered to consider the likelihood that magnate A. G. Spalding, who had already by 1895 placed his brother James at the helm of the sporting goods company, would be sending handwritten collection letters for $5.35 to small town merchants in Indiana. He wouldn’t have. If Steve Grad and PSA had examined the document utilizing the exemplars of authentic Spalding letters they had already issued LOAs for in previous auction sales, the 1895 letter would have been rejected and readily identified as a fraudulent attempt to pass off a generic Spalding company letter as a gem signed by Spalding himself. Grad, however, did have access to the authentic documents, which makes this situation more problematic and indicative of how PSA/DNA and auction houses conduct business. 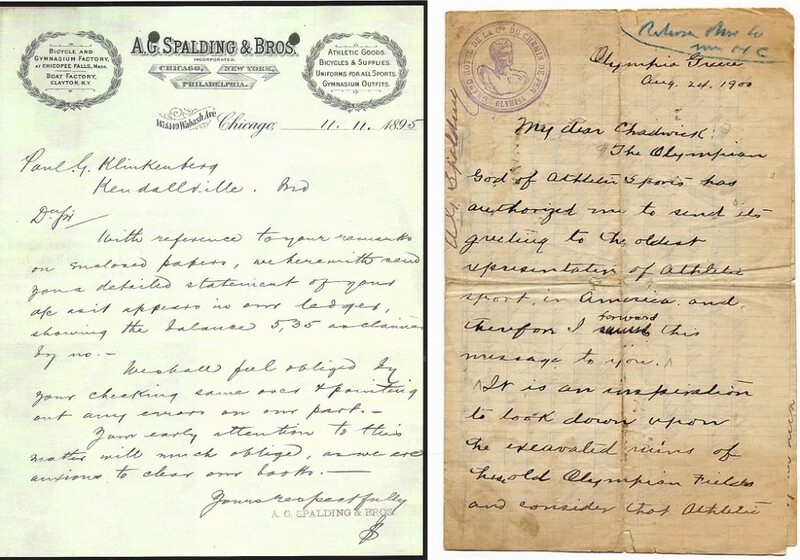 The letter LOAd as a genuine Spalding, although it was actually written by a Spalding employee in 1895 (left), contrasts a genuine letter written by Spalding in 1900 (right). There are so many reasons, aside from handwriting, that rule this document out as an authentic Spalding letter, however, when the actual handwriting itself is compared against genuine specimens, Grad and PSA/DNAs letters of authenticity can be summarily dismissed as fraudulent instruments that transformed a relatively worthless piece of paper into a liquid asset. This situation, however, is not an isolated incident as PSA/DNA and Grad have continued authenticating Spalding forgeries as authentic including a recent offering encapsulated in a PSA/DNA holder. An alleged Spalding autograph was encapsulated and authenticated by Grad and PSA/DNA (top) despite the fact the handwriting exhibits all of the traits of a forgery when compared to an authentic inscribed copy of Spalding's 1911 book, America's National Game (Bottom). We believe the forger used this authentic example (once in the Barry Halper Collection) as his guide. The key is how he attempted to replicate the word "Loma" which appears to be the product of a problem with Spalding's original pen. Steve Verkman and Clean Sweep Auctions in January featured what appeared to be a cut and inscribed page bearing what was advertised as Spalding’s signature sealed in a plastic tomb created by PSA and marked “Cut-Albert Spalding PSA/DNA Certified.” Clean Sweep called it a “true 3×5″ and made no mention of Spalding’s book from 1911, however, if this item is compared against an actual authentic inscribed copy of Spalding’s 1911 book it becomes quite apparent that PSA/DNA has certified yet another Spalding forgery. The slabbed signature sold for $3,302, but when compared to scores of other authentic exemplars written by Spalding in inscribed copies of his book presented as Christmas gifts for his friends and colleagues in December of 1911. The Clean Sweep offering is a fairly well-executed forgery but exhibits evidence of being copied and patterned directly from an authentic exemplar from the 1911 book which was once part of the Barry Halper Collection (see illustration). PSA should have realized this because they actually have two additional authentic examples of Spalding signed books dated from December of 1911 on its “Autograph Facts” page. 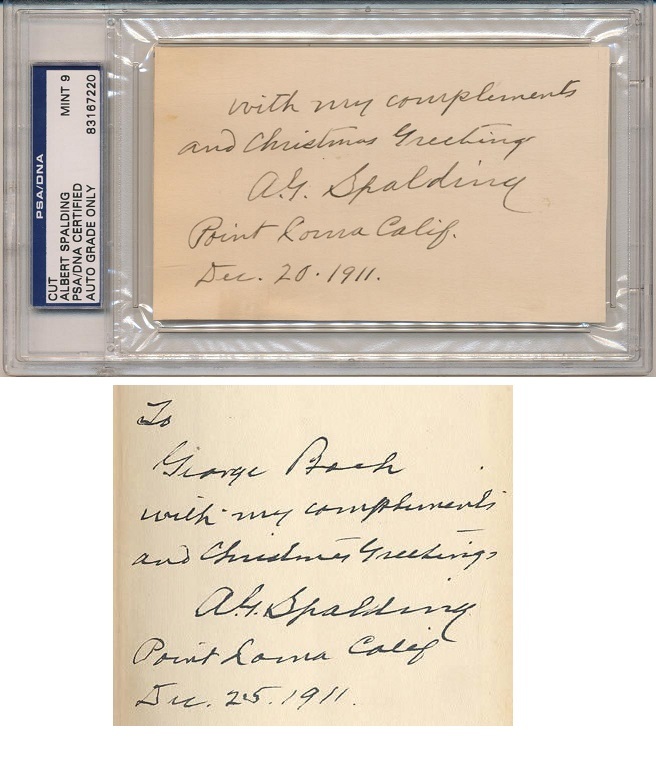 In stark contrast to the PSA encapsulated Spalding inscription sold at Clean Sweep are two authentic Spalding exemplars actually signed by Spalding in December of 1911. These two exemplars appear on PSA's "Autograph Facts" page. The Spalding PSA-authenticated forgery (top left) not only clashes with the handwriting exhibited on five other authentic Spalding inscriptions signed in 1911, it also includes a period placed after the abbreviation "Calif". It appears the forger may have given himself away here as well with this period placement. The encapsulated Spalding signature exhibits hesitations and stoppages that are characteristic of a forgery and lacks the uniformity of what PSA correctly identified in their study as the “sharp, jagged examples from the last decade of (Spalding’s) life.” The most striking deficiency in the PSA certified forgery is the absence of these very sharp and angular strokes that define Spalding’s handwriting at this period in his life. The forgery lacks the natural flow of Spalding’s handwriting and the contrast is most apparent when the forgery stands next to the five genuine examples in our illustration. In addition, we noticed that the forger may have made a critical mistake that also gave him away; the forged and slabbed signature includes a period placed after Spalding’s abbreviated “Calif.” We examined at least ten authentic inscribed and signed Spalding books with the “Point Loma” inscription and none of them included punctuation after the “Calif” abbreviation. Only the PSA authenticated forgery included a period. Most collectors would be fooled by this decent forgery which is a great example to illustrate how a forger can replicate a signature and convince an alleged expert it is genuine. Of course it “looks like” a genuine Spalding, that’s what the forger is trying to achieve. However, when analyzed closely it is exposed that it only mimics an authentic signature and shows evidence of another hand, that of the forger. 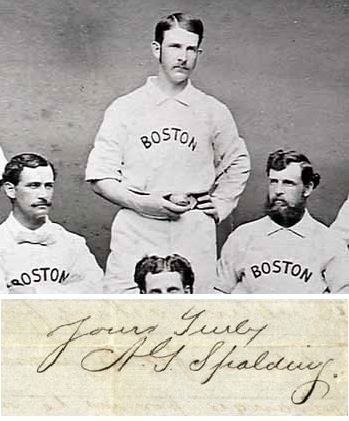 At least the slabbed Spalding actually looked like Spalding’s scrawl, whereas the 1895 Spalding company letter exhibited virtually no resemblance to Spalding’s actual handwriting. That would include these two misrepresented Spalding forgeries authenticated by Steve Grad and PSA/DNA. perhaps someone can tell me, did steve grad study under jimmy spence? do any of you find it odd that both of these ‘experienced’ autograph authenticrapers are blind in at least one eye? 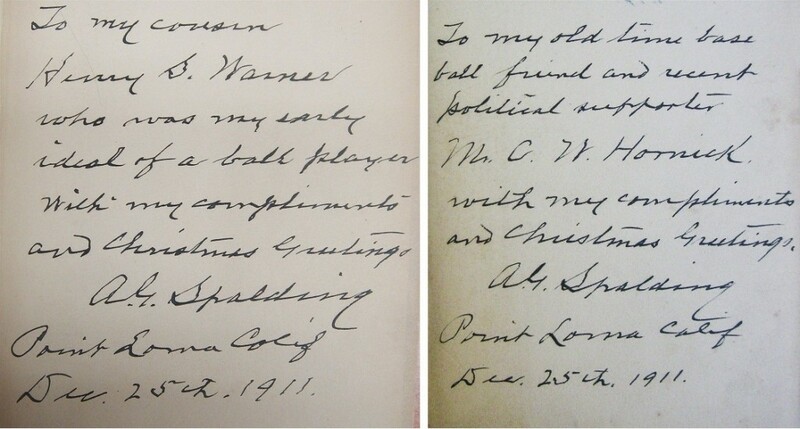 Spalding’s signature and writings causes a big stir because of his slow hand…. what does it all amount to Mr. Nice? We know this letter is undoubtedly authentic for it is believed to have been stolen from the National Baseball Library’s Ford Frick Papers which include hundreds of such thank you letters for season passes. The thefts of the Frick letters were covered in a recent article we published stating that Cooperstown may have lost close to $500,000 in documents wrongfully removed from the Frick holdings housed in the library.